International Film and Television Industries, Costumed Guides, and Re-enactors supplied. Period Fans carefully made to render well on film and video. (Old and faded fans seldom show up well and are often very fragile.) 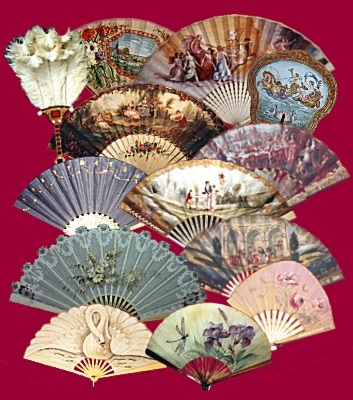 An increasing stock of purpose made fans of the 16th to 20th centuries are available for hire. We can also make up any extra quantities that are over and above our current stock at reasonably short notice. We are able to execute any special design modifications that you may require, such as water-resistant, colour matched, or oversized. Illustrations of our current stock for the period you are interested in can be e-mailed to you as attachments. Jump to our contact page.